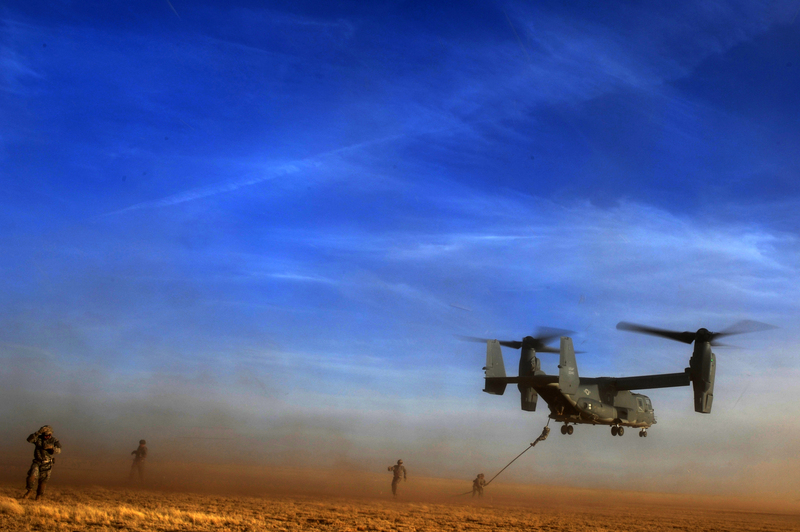 Any photo I choose would make the person in it look like a schmuck, so here's a cool photo of a CV-22 landing at Cannon Air Force Base, N.M.
Americans believe the Air Force is third-most important branch of the military, trailing the Army and Marine Corps, according to a recent national poll. Seventeen percent of respondents listed the Air Force as “most important to our national defense,” Gallup announced June 21. The Army was seen as the most important (25 percent), followed by the Marines (24 percent), the Navy (11 percent) and the Coast Guard (3 percent). Sixteen percent believed the branches were the same. Gallup interviewed 1,020 adults representing all 50 states and the District of Columbia. The margin of error was 5 percent. The findings represent a shift in post-9/11 thinking. In May 2001, 42 percent of respondents listed the Air Force as the most important branch – far ahead of the Army (18 percent), Navy (15 percent) and Marines (14 percent). The Air Force’s prominence slipped in polls conducted in May 2002, when 36 percent of respondents listed the service as the most important, and in May 2004, when that number slipped to 23 percent. Gallup began asking Americans about importance of the military branches during the 1940s, and the 2004 poll was the first time the Air Force didn’t top the list. Gallup also asked respondents which branch they view as the most prestigious. The response: Marine Corps, with 46 percent; followed by the Army, with 22 percent; the Air Force, with 15 percent; the Navy, with 8 percent; and the Coast Guard with 2 percent. Five percent said the branches were the same. The Air Force’s score is a drop of more than half since 2001, when 32 percent of respondents listed the service as the most prestigious.